Following the death of Bishop Javier Echevarria on 12th December 2016, an elective congress was conceived in Rome in which Mosignor Fernando Ocariz was elected Prelate. 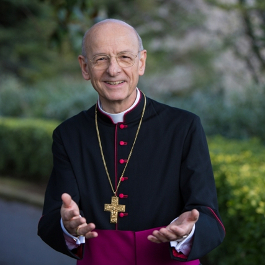 On the same day, The Holy Father, Pope Francis confirmed him as the new Prelate of Opus Dei. Until then Mosignor Ocariz was the Auxilluary Vicar. In this role, he was the principal assistant to Bishop Javier Echevarria. Monsignor Fernando Ocariz was born in Paris on October 27, 1944, in a Spanish family exiled in France due to the Spanish Civil War (1936-1939). The youngest of eight children, he graduated from the University of Barcelona with a degree in Physical Sciences in 1966. He received a licentiate in Theology from the Pontifical Lateran University in 1969 and a doctorate in Theology from the University of Navarra in 1971, the year he was ordained a priest. In his first years as a priest he was especially involved in ministry to young people and university students. Over the past 22 years he has accompanied the previous Prelate, Bishop Javier Echevarria, on his pastoral trips to more than 70 countries. Monsignor Ocariz becomes the third successor to Saint Josemaria. A Mass of the Holy Spirit was held here in the school on 23rd January to pray for guidance for those electing the new prelate. On 27th January, a Mass of thanks giving attended by very many students and members of staff was held in the school chapel to thank God for the gift of the new Prelate. All of us are invited to pray for the new Prelate as he takes over his new role as shepherd and Father of many sons and daughters including those in Strathmore School. This entry was posted in Chaplaincy. Bookmark the permalink.